Why Francis Lawrence is My New Best Friend. Something monumental has just occurred in my life. Sadly I haven’t met that special someone who is named after my favorite bread. (Jeez mom, calm yourself down, it’ll happen.) I also still have yet to discover how to make something from Pinterest look like it did on the damn website. What has happened to today is bigger than that. I have made a new best friend. His name is Francis Lawrence. He’s a kind, gentle soul, and many people would say he is downright awesome. He listens, he cares, and he is there for you. Never heard of Francis Lawrence? Well let me enlighten you. Who better to do that since I am his new best friend? Francis Lawrence is the director of Catching Fire the second book in the enthralling Hunger Games series. He’s also going to direct Mockingjay. He is a simply wonderful man who I have never actually met before. But don’t worry, we’re still best friends. 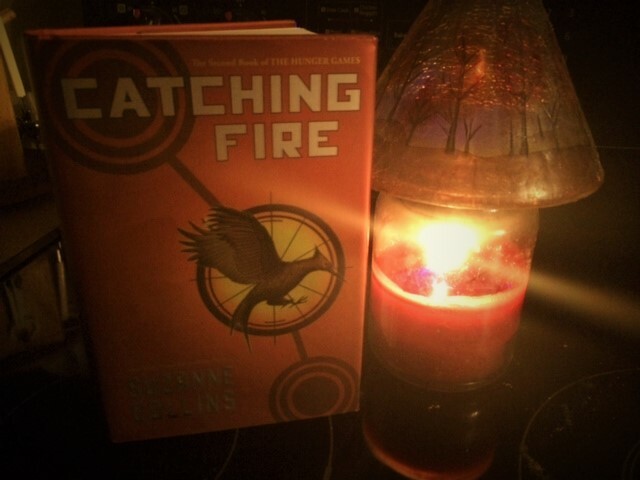 Before you ask, yes I took a picture of my Catching Fire book next to a candle with a woodland scene on top of it. Have some respect. That candle is from Yankee Candle and it smells heavenly. As Francis Lawrence and I are now best friends I found it only right that I take the time to commend him on a job well done, and point out the many things he did to make Catching Fire one of the best movie adaptations out there. Period. Jennifer Lawrence and Josh Hutcherson. I love, and I mean love these two as Katniss and Peeta. Their performance in this movie was outstanding, and it really had me believing exactly what they were trying to portray: Two people who care for each other deeply, but are still trying to figure out what that all means. Two words: Finnick. One word: Love him. Finnick Odair is by far my favorite character (besides Katniss and Peeta) in the whole entire series. He honestly is the character that really made me adore these books. He was also the one character I really cared about casting with. In my mind they had to nail him, or I was not gonna be sold and would probably shed a tear for my dear Finnick. Boy was I happy though with Sam Claflin’s portrayal of Finnick. He did that character justice. He made me love him and want to hug him, and if I wasn’t already newly best friends with Francis Lawrence, I’d be best friends with him too by now. Jena Malone is crazy in the best kind of way. Jena Malone portrays Johanna, a very unique victor from District 7. I have a soft spot for Johanna, because I like me some crazy, and that girl is crazy in the best possible way. Jena Malone plays into that crazy perfectly, and when times were really tense in this movie she added the fun and wildness that was necessary for that little comic relief. The merry band of previously victorious victors. All of the actors chosen to play the other victors for this round of The Hunger Games were phenomenal. Even if they only had one line, I loved every minute of them being on-screen. Mags is by far the stand out of this group. Well done Lynn Cohen. The chemistry between Katniss and Peeta. Don’t get me wrong, in The Hunger Games I believed that Katniss and Peeta “liked” each other as they did in the book, but I wasn’t overwhelmed by their “likeness.” But in Catching Fire I was amazed at how much these two characters and actors were able to make me believe that they really cared for one another. And let’s be honest it just looked like they liked each other a hell of a lot more in this movie. The arena. Let me tell you, it took me a while when I read Catching Fire to really picture where they were competing for their lives. I just couldn’t pin point an image in my head. The arena they created in this movie, blew my mental picture out of the water. That arena is the definition of how CGI and real locations can be used to create something mind-blowing. The up, close, and personal IMAX experience. I had never seen a movie in IMAX until this one. Let me tell you it was definitely an experience, and it added to the great visuals of the last half of the film. Also, if you’re looking to learn how many freckles each cast member has on their face, IMAX is your new best friend. The image was so clear, I am pretty sure I was able to see the actors faces clearer than I have ever seen my own. Have you come back from seeing Catching Fire yet? If not, it still isn’t too late. Suffice to say this movie was by far one of the best book to movie adaptations I have ever seen. It did a fantastic job capturing this book, and presenting a story that I and so many others fell in love with. Francis Lawrence you are my new best friend. You have set the bar higher than any of the trees Katniss could climb, and I applaud you for that. You may not care that what I think, but you should. We are best friends after all. You need to get there asap.